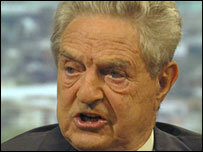 US billionaire George Soros is to give $50m (£26.7m)to help tackle poverty and Aids in Africa. Mr Soros pledged to hand the cash to the United Nations' (UN) Millennium Villages Project over five years. The $100m-scheme involves targeted investment in health, education and farming to help lift African villages out of poverty. It currently covers around 79 villages in 10 countries, including Ethiopia, Ghana, Mali, Rwanda and Uganda. "This is a very important project. It's meant to serve as a prototype that can be scaled up," Mr Soros said in an interview with Reuters. "If it's successful, it can really be scaled up and make a major impact on rural poverty in Africa," he added. Under the scheme, villages are supplied with mosquito nets to prevent the spread of malaria, fertilisers and treatment for people living with HIV/Aids. Sauri in Kenya - the first village to get UN backing two year ago - has already produced a food surplus and seen school grades improve. The scheme makes up part of the UN's Millennium Development Goals, which are internationally agreed targets to cut poverty, hunger, disease and boost literacy by 2015. Did Live 8 make a difference? Can aid really end poverty? Did the G8 Make a Difference?